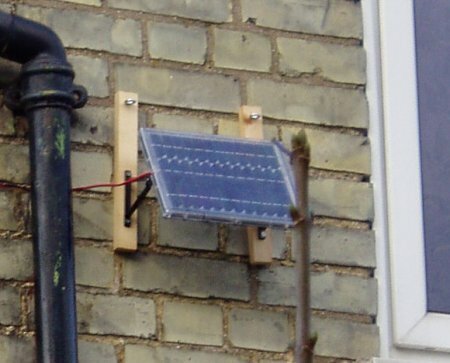 In early 2006 I fitted a small solar panel to the side of my house. The original idea was to power my birdbox cam from it, but the bluetits never moved in and it has been idle. So I thought, why not try to power my slug from it? The panel nominally generates 4.8 W at 12 V. Even half of that could be enough to run a Slug [aka Linksys NSLU2, a 266 MHz XScale Linux box]. All that's needed is an efficient power supply. So the converter is about 73% efficient in practice, and I'll need to get 70% of the rated power from the panel to drive the Slug with its flash drive. The weather this morning was sunny but not yet shining directly onto the panel, and the Slug failed to start. This afternoon the sun was more direct but the sky was slightly hazy; when it was at its brightest it was possible to boot the Slug alone (pictured), but it was never bright enough to boot the Slug with its flash stick. In the picture you can see that I tried adding a 1000 uF capacitor across the input; this probably didn't make much difference. 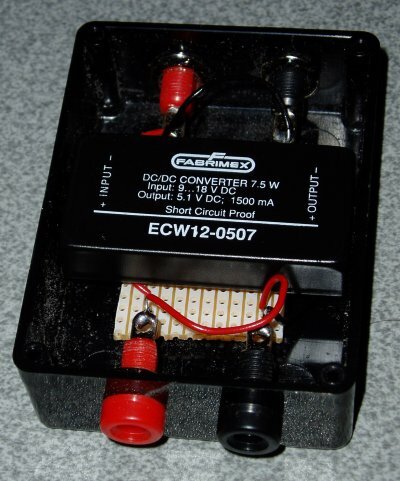 When the panel was unable to meet the demand from the Slug the regulator would get into a "100% duty cycle" condition from which it cannot recover without disconnecting; a better behaviour in solar applications would be to shutdown for a few seconds. I plan to investigate this further. I will try again, but my conclusion so far is that you need a panel rated considerably above 4.8 W to run a Slug from.